Here we have Fine Folks and Good Hunting . . . I'll be back!" Brenda Valentine, America's First Lady of Hunting, of Buchanan, Tennessee, took a Pope &Young class buck with us. Our lodge has 10 spacious bedrooms, each with private bath, comfortable lodge meeting areas, and our highly rated dining, we offer you comfort and hunting convenience not found at other lodges. In fact, our facilities are used for family reunions, wedding receptions, and corporate dinners and meetings. . . Victory dinners of fresh turnip greens, fresh candied sweet potatoes, seasoned field peas, pork tenderloin, sweet coleslaw, corn bread, dinner rolls, iced tea, and a dose of strawberry shortcake, are to die for.. The minimum legal buck in the State of Mississippi is 4 points, but to keep on providing the quality bucks we produce it is a minimum of six (6) points or better for primitive weapons hunting, and eight (8) points or better for gun hunting. We charge a penalty for taking a buck less than the minimum and for wounding game that cannot be recovered. Quality deer aren’t produced unless the property is managed correctly and that is of high importance on this property. Turkey Hunts - $295.00 ($US) per day. Two day minimum with one gobbler allowed per two day hunt. 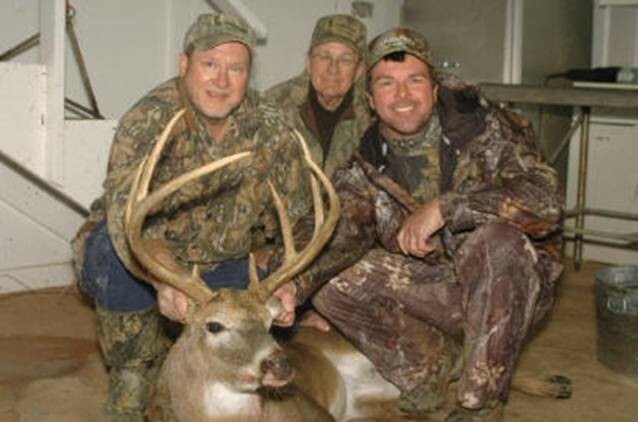 Guided hunts are $100.00 per day extra. On all the above hunts, we furnish the hunt, all meals, transportation to and from the hunting area, and a guide for placement in the hunting area. • Airport - Meridian, Mississippi. Airport pickup and delivery charges are $30.00 per airport trip. the lodge for more information. • No refunds of deposits or fees. • All Mississippi game laws are enforced. is your only assurance or your reserved date and hunt arrangements!